Yesterday I attended McDonald’s annual shareholder’s meeting to ask them to stop taking advantage of children’s developmental vulnerabilities with predatory marketing. 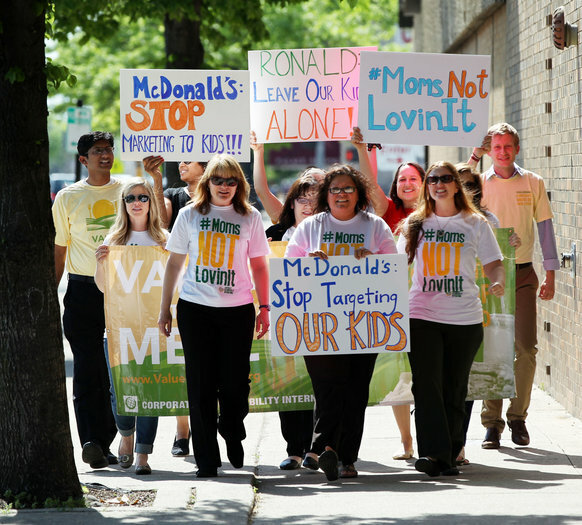 I was invited by Corporate Accountability International (CAI) as part of their #MomsNotLovinIt campaign. Also included were Bettina Siegel of The Lunch Tray, Sally Kuzemchak of Real Mom Nutrition, Leah Segedie, founder of the Mamavation community, Migdalia Rivera, associate campaign director at MomsRising.org, Rosa Perea, a health educator and assistant director of the Centro Comunitario Juan Diego in Chicago’s South Side, and Greg Akili, a Los Angeles-based social justice activist. At last year’s meeting, 9-year-old Hannah Robertson asked CEO Don Thompson to stop tricking kids. Her question and his answer that “we don’t sell junk food” made headlines. It was obvious from the changes at this year’s meeting that McDonald’s was doing everything they could to avoid another media mess. That meant no press, no tweeting, and no cell phones. Instead of allowing us to ask our questions on a “first come, first serve” basis as had been done in the past, they asked us to submit our question topics in writing. That way they could choose which questions were asked during the general discussion part of the meeting (which was moved to AFTER the meeting was officially adjourned). My name is Casey Hinds and I’m a mother from Lexington, Kentucky. With a family history of type 2 diabetes, it’s been important to prevent my children from getting hooked on fast food and sugary drinks. We don’t eat at McDonald’s but that’s not enough when Ronald McDonald is the Joe Camel of fast food. I can and do turn off the ads at home but parents like me are undermined when you use schools to market to kids and reach them behind our backs. Fast food fundraisers and Ronald McDonald in libraries are examples of marketing masked as benevolence that I’ve seen in my community. There’s movement at all levels of government to make our classrooms places where our kids aren’t bombarded by junk food brands. When will you stop undermining public health advocates, parents and elected officials who are working to make schools free of fast food marketing? 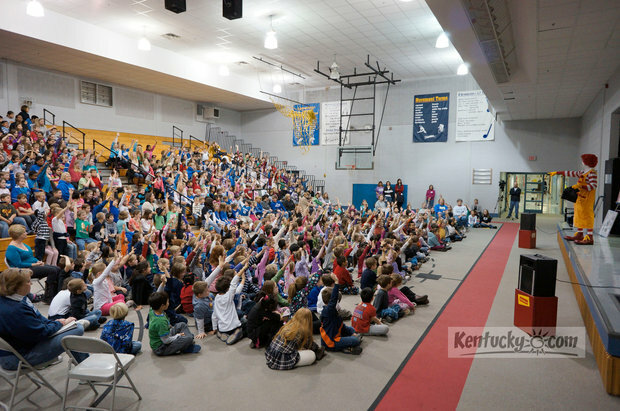 Immediately, this picture from our local paper of Ronald McDonald at an elementary school assembly popped into my head. Are the executives at McDonald’s completely out of touch with reality? He went on to talk about McDonald’s “opening doors of opportunity” but as a veteran, I thought of all the doors closed to young people because of obesity. Mission Readiness has brought attention to the national security issue when 25 percent of young people are too overweight to join the military. It also can close the doors to careers in law enforcement, firefighting paramedics, and even truck driving. He touted McDonald’s selling 1.1 billion bags of apples with no mention of how much added sugar his company contributes to diets. He was excited to use a clip of Bill Clinton and the Alliance for a Healthier Generation to promote McDonald’s role as an advocate for fruits and vegetables. It rang hollow when the pictures of Big Macs, fries and sugary drinks on the wall behind him reminded us exactly what they rely on for profits. He made a big deal of adding Go-Gurt to Happy Meals with 25 precent less sugar. Of course he never mentioned exactly how much added sugar was in it. McDonald’s marketing sugary yogurt to kids as “healthy” is not the kind of help parents need. McDonald’s determination of what’s junk food and what’s healthy is questionable when even their shareholders had to ask them to serve something other than cookies for breakfast at next year’s meeting. Many thanks to the team at Corporate Accountability International for this opportunity to speak to power and my fellow moms/bloggers who were with me in person as well as all of you who were cheering us on. I loved hearing the shareholder complaint about being served “sugary cookies” at the meeting. Thanks for fighting the good fight, Casey. Thanks and I’ll have to check out how they were spinning it. Where are we left to turn when the corporations are flat out LYING?